Dobbin Clothing: Happy 4th Of July From Dobbin! Happy 4th Of July From Dobbin! When you buy American-made, you are supporting the US economy, and keeping jobs stateside. When you buy American-made, you are ensuring fair pay and safe workplaces for the people who make your clothes. When you buy American-made, you are paying for quality construction and attention to detail. When you buy American-made, you are helping the environment -- factories here abide by stricter environmental regulations, and it takes a lot of fuel to transport clothing from China. When you buy American-made, you are giving a boost to the companies that care enough to manufacture their goods in the US, and allowing them to keep manufacturing here. Here at Dobbin, we make all of our clothing in the United States. Every single piece. We know it's not the easiest or cheapest way to do things, but we wouldn't have it any other way. This is a great country we live in, and looking for that "Made in USA" tag is one way to help keep it great. We think fashion can stand for something, and we're glad you do, too. 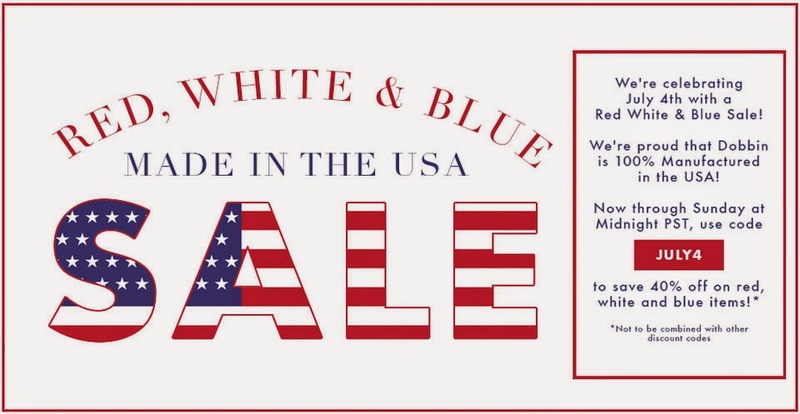 To celebrate the 4th and to thank you for your support, we're having a Red, White, and Blue Sale. From now until Sunday at midnight, take 40% off any red, white, and blue items when you enter the code JULY4 at checkout. Happy holiday weekend, and happy shopping!